← Looking Good or Just Good Looking? Mrs. E. and I don’t mind eating at the bar every now and again, do you? Sometimes we change up the seating arrangements at dinner parties, too. This particular evening was a birthday dinner for a dear friend. 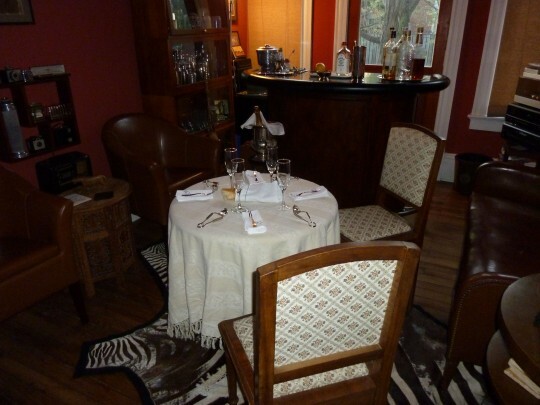 We hid his gift, a red bistro table that he didn’t know he wanted, under the table-cloth and revealed it after dessert. I couldn’t figure out how to wrap it any other way. The main course was Veal Oscar crêpes with a béarnaise sauce, which cooked down rather too much somewhere around the second martini. approx. 1/4 lb. of crab meat. Melt the butter in a skillet and sauté the veal, add salt and pepper to taste. Microwave the asparagus in a wet paper towel for about a minute. Fill each crêpe with the veal and some asparagus spears. Top with crab meat. Fold and sauce with the béarnaise, serve asap. 1 tsp. of lemon juice. Cook shallots/chives, wine and tarragon in a sauce pan over medium-high heat for about five minutes. Let cool a bit (this is a good time to stuff the crêpes). Heat butter until it bubbles. Pour herb/wine mixture into a blender. Add in egg yolks and salt; pulse to blend. Turn on the blender and pour in the hot butter through the hole in the top of the blender cover. Stir in parsley and lemon juice. Do not over-blend or put this back on the fire to keep warm… it will thicken too much… Pour straight from the blender onto the crêpes and serve immediately. * Crêpes are essentially thin pancakes. you can cook them on an upside down griddle, in a traditional pan or in a skillet by rolling the batter around the inside of the pan. The first one will be useless, in my experience, but the second and on will be keepers. Into your blender add: 4 eggs, 1/4 tsp salt, 2 cups flour, 2 1/4 cups milk, 1/4 cup melted butter. Blend for a minute, scrap down the sides, blend for another 15-30 seconds or so and refrigerate for an hour. Makes a lot…. perhaps 3 dozen, which can be frozen by separating with wax paper. 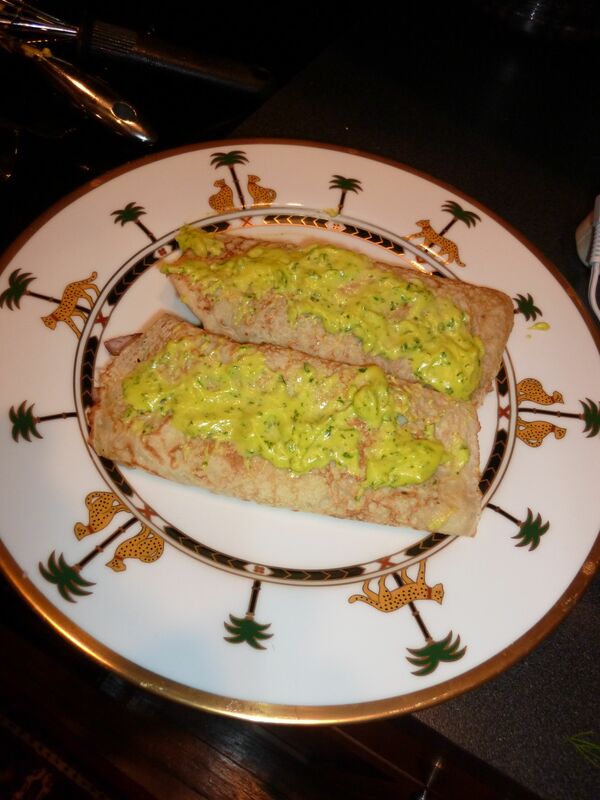 For a quick dessert fold crêpes into triangles, sprinkle with lemon juice and powdered or superfine sugar. 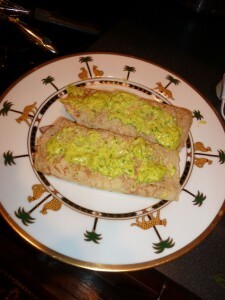 This entry was posted in Entertaining and tagged Blender Bearnaise Sauce, Blender crêpes, easy and elegant recipes, Entertaining, Quick Dessert Crêpes, Veal Oscar Crêpes. Bookmark the permalink. Well, now I know what’s for dinner Saturday night. Nothing quite like drinking one’s dinner seated next to a good companion! What a charming gift! I’d gladly eat PB&J (and do, often) to receive a gift as thoughtful and clever. I love the plates. Very handsome presentation! Dishes are such a joy and always interesting to see what everyone chooses and owns. A blog on china/serving pieces would be enjoyable some time should you ever run out of ideas. Photos of vintage and new china would be great fun. Come to think of it -Mrs.Blandings and I had dinner at the bar. It was rather lovely, profile and all. Very clever of you to cover the present and “dine” on it! The crepes look wonderful. I love eating at the bar, it’s where all the action is!